Florida's Largest Specialty Travel Agency! 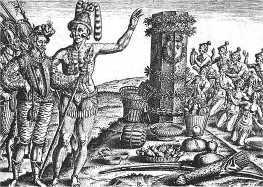 Unknown to the Indians of Florida, their destiny was being determined by political and economic forces taking place across the Atlantic Ocean in Europe. At the end of the fifteenth century, thousands of daring adventurers would be crossing the ocean to conquer within a few centuries what had taken the Indians thousands to years to inhabit. The conquistadors of Spain who ventured into the lands of the Indians were motivated by many forces. The discovery of gold in Mexico and Peru caused thousands of impoverished Spanish peasants to join the military. Under the rules of primogeniture, younger sons of the nobility would not inherit much of the family estate, but leading a successful colonial mission could give you the funds to build a castle. Others sought glory and fame, now that the wars with the Moors were over. 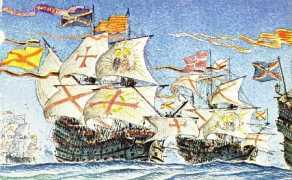 Only in the New World was there the opportunity for quick advancement in the Spanish military and diplomatic careers. Finally, there were those who came for spiritual reasons. They were more than just the priests and church leaders. Catholic Spain had a strong missionary zeal, for they had engaged the Muslim infidels for four centuries. The eternal blessing of God would be earned by converting the Americas into Catholic lands. This Site describes the 15 year Conquest of Native America. Cabeza de Vaca's eight years in North America, starting in 1528, set the stage for Coronado and Hernando de Soto to lead armies deep into America in the 1540's: Coronado from Mexico City and DeSoto from Cuba, Spain's "Ellis Island." Vaca was the first European to describe this continent, but only near its southern shoreline. DeSoto, at age 39, was rich from Incan gold and wanted to colonize North America. To do so, he planned to open a passage to trade Spain's New World fortunes with China, the largest supermarket in the world. Intelligent Indians had told Vaca of a northern sea that DeSoto believed was the Pacific Ocean, the sea Balboa discovered beyond Panama, DeSoto's boyhood home. Magellan had sailed that sea to the Orient when DeSoto was 21 years old, but lost his life on that long voyage. DeSoto wanted to build a port on America's Northern Sea, then sail what he believed was a short distance across it to China. He planned to protect his "Northern Passage to China" from Mobile Bay, Alabama, which Vaca had visited and DeSoto planned to use as Spain's new "commanding" stronghold in America, home for his settlers and a beacon for New World settlement. In March of 1513, Ponce de Leon sailed into the Bahamas headed toward Florida, then considered by slave hunters and fishermen to be a large island. He was seeking a spiritual rebirth with the fountain of youth, not a physical rebirth with some wonder water. On Easter Sunday, March 27, 1513, his crew sighted land, probably Abaco Island. Six days later he reached the Florida coast and sailing northward to land near St. Augustine. He named the place "Pescua Florida", "the place of flowers," perhaps in honor of Easter Sunday. Bookmark this site for the latest Orlando Hotel Discounts!